Master Bible scholar and teacher Marc Brettler argues that today's contemporary readers can only understand the ancient Hebrew Scripture by knowing more about the culture that produced it. And so Brettler unpacks the literary conventions, ideological assumptions, and historical conditions that inform the biblical text and demonstrates how modern critical scholarship and archaeological discoveries shed light on this fascinating and complex literature. Brettler surveys representative biblical texts from different genres to illustrate how modern can read these texts. He guides us in reading the Bible as it was read in the biblical period, independent of later religious norms and interpretive traditions. Understanding the Bible this way lets us appreciate it as an interesting text that speaks in multiple voices on profound issues. 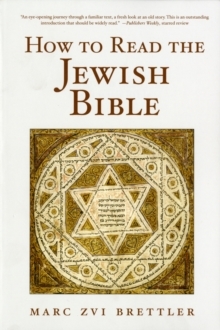 Although the emphasis of How to Read the Jewish Bible is on showing contemporary Jews, as well as Christians, how they can relate to the Bible in a more meaningful way, readers at any level of religious faith can benefit greatly from this comprehensive but remarkably clear guide to interpreting the Jewish Bible.